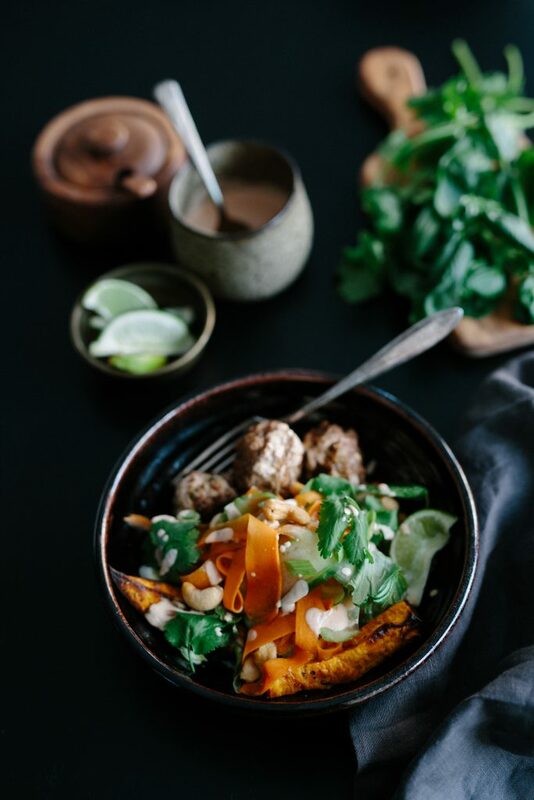 I’m crazy in love with Asian flavors in food and this bowl hits everything that I love including sweet and salty. 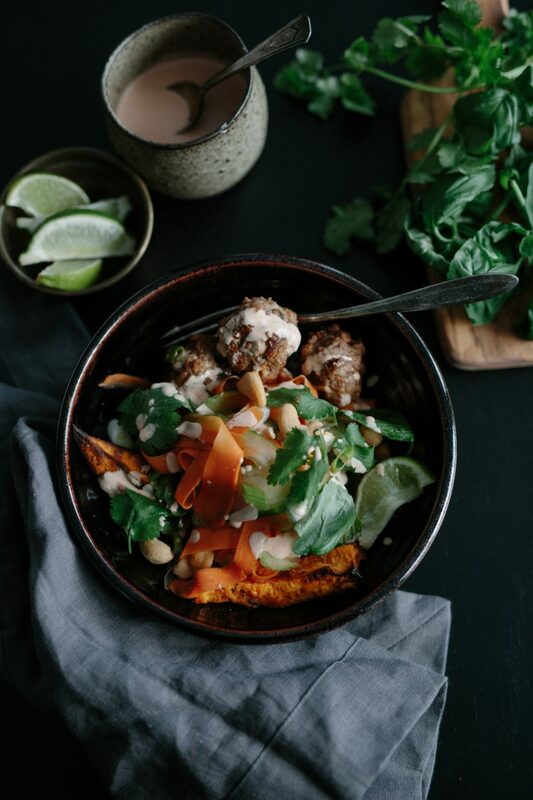 This bowl of spicy pork meatballs, sweet potato, pickled carrots, cucumber, mint, basil, mint, green onion, salted cashews and covered in a spicy yogurt & mayo sauce. It’s insanely good and I served this to a group of my girlfriends and promised I would share the recipe. I adapted this recipe based on a few recipes I found and tweaked to my taste buds. Jump over to Pinch of Yum for her version. Combine pork, ginger, garlic, sriracha, fish sauce, sesame oil, garlic powder, sea salt, green onion, cilantro and arrowroot in a bowl. Form into bite sized meatballs. Cover and place in the fridge to chill while preparing the remainder of the ingredients. Heat a non stick skillet and add a few teaspoons ghee. Place the meatballs in the skillet and fry on each side until golden brown and no longer pink in the centre. In a medium bowl combine rice vinegar, coconut sugar, sesame oil, and sea salt. Shave the carrots into the bowl. Toss to combine. Cover and place in the fridge for one hour. Combine the mayo, yogurt, sriracha, garlic powder, coconut aminos, sea salt and honey in a bowl. Stir to combine. To plate: Place a few roasted sweet potatoes in a bowl. Top with carrots, cucumber, cilantro, mint, basil, cashews, green onions and drizzle with spicy yogurt and mayo sauce.